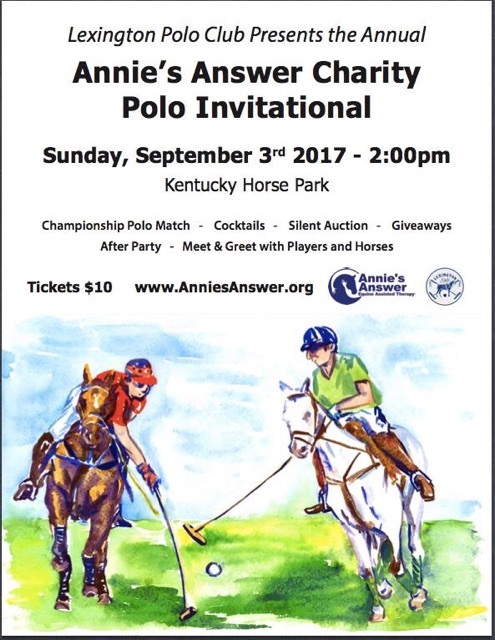 Annie's answer Cherity polo invitational Sunday, September 3rd! Last polo match of the season! Come out and enjoy the last polo match of the season. Lexington polo is featuring a 14 goal match on man-of-war field Saturday at 3 PM. Hope to see you there! Lexington Polo is proud to host the USPA Amateur Cup this Friday and Sunday! Hope to see everyone at the Park Equine International Polo Cup 2015 on Sunday at 4 p.m. at The Kentucky Horse Park. As a member, friend or family of Lexington Polo Club we want to make sure you are personally invited and sincerely hope you will attend the Celebration of Polo Cocktail Party next Wednesday July 15th at Fritz Farm here in Lexington KY! Cocktails and hors d'evours will be passed, Arthur Hancock and The Wooks will be playing bluegrass music and the entire event is complimentary for you and your guest. Come out and enjoy a great event with the polo community! Don't know what to say...the rain won't go away! Polo canceled due to rain. Fields are too wet. We will try for Tuesday practice! On Friday, June 26th the match will start at 5pm (Man O War Field) and will feature antique and modern coaching carriages on display for the public during the match. Come enjoy a great day of polo and experience a rare opportunity to see the amazing carriages. Lexington Polo's James Miller and Team Win the 2015 Lakes Cup 12 Goal! Today we will say good bye to 2014 grass season with a match on Man onWar at 5:00 pm. The Warfield Farm Cup will be presented by Michelle Primm after the match. We look forward to see you all at the match. Practice Chukkers will be held on Man o War at 4:30pm. Today on Man o War polo field an 8 goal challenge will be played at 4:30. Don't miss this great match.!! !